@BifBangPow: "Klytus, I'm bored. What plaything can you offer me today?" After the success of Bif Bang Pow! 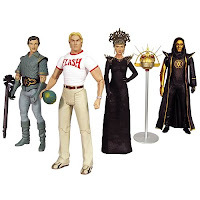 's 'Flash Gordon' Wave 1 figures of Flash and Ming, we got asked all year, "Hey, what about the rest of the gang? I want them all! I want to save the universe!" Ok, well maybe it doesn't get THAT serious, but never let it be said we here at BBP! Headquarters don't listen to the fans. Wave 2 of our Alex Ross designed action figures from 'Flash Gordon' is now available for pre-order over at Entertainment Earth. They're made to Mr. Ross' exacting details, and the line up includes Flash in T shirt (which all good fans know debuted at San Diego Comic Con last summer), Prince Barin as portrayed by Timothy Dalton, Melody Anderson as Dale Arden and the inimitable Peter Wyngarde, as the sleaziest right hand man in sci fi, Klytus. All feature multiple points of articulation, exclusive new Wave 2 packaging, and Dale even comes with the floating security droid! (Floating ability sold separately). Hurry over now and get 'em while you can, they'll be as limited as Wave 1's Flash and Ming. Collect them all, and yes, Save the Universe! !